The new Leiria Museum, or Museum of Leiria, is a proof that the memory of our ancestors can be safeguarded with patience and dedication, and be presented to everyone, today and in the future. This museum is the result of an idea from many for all. 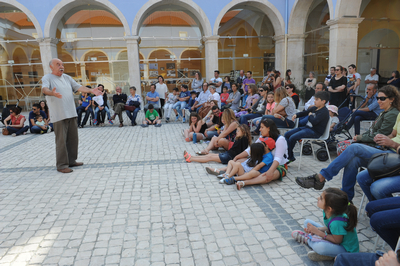 Only on November 15th, 2015, when the new Leiria Museum was finally inaugurated, did the idea come into fruition. The Leiria Museum is a history museum dedicated to the region of Leiria, in central Portugal. It is an open window to the memory of a long inhabited territory, which has taken an alternative vision of the reality of an ancient museum at the beginning of the 21st century. Since its opening, access has been enabled to important patrimonial, historical, archaeological, artistic and educational collections, which until then were not truly and fully accessible to the general public. The museum has had four different locations since 1917 and between 1986 and 2015 it was even closed; the reopening was enabled by a 3 million Euro investment in its renovation and redevelopment. The collection has been brought together and is now installed in the 16th-century Saint Augustine Convent, one of the most important monastic complexes of Leiria, classified as property of public interest. The convent has been completely restored and converted into the museum. Originally, the Leiria Museum was named Regional Museum of Arts, Archaeology and Numismatics of Leiria. Not only we have changed its name to Leiria Museum, but, more importantly, we changed our attitude. The Leiria Museum is now the centrepiece of the municipal network of museums. It aims to preserve and interpret the identity of the Leiria people in a contemporary way, fusing history, memory and identity, while acting as an integrator of new sociocultural experiences. Having a strong relationship with the community it belongs to is considered essential for this museum. In order for such cultural space to become a reality for both residents and visitors, it has to accomplish a variety of needs. Besides the concern for heritage, the Leiria Museum takes a strong inclusive stand through differentiated ways and means of communicating with its audience: not only through observation and contemplation, as in traditional museography, but also through the use of ICT (Information, Communication and Technology), which guarantees better and more interactive communication. The Leiria Museum also takes into account the current needs of a visitor in terms of comfort and safety. As such, it is an inclusive museum - welcoming, comfortable and friendly for everybody. It carefully integrates spaces and uses innovative techniques and technologies to improve accessibility even more, becoming barrier-free and promoting equal opportunities for all. > disabled access has been installed for those visitors with physical impairments. General information is multilingual; there are bilingual exhibitions, audio and video guides in four languages and multimedia solutions, part of an ongoing process of creating a virtual tour, including an audio-description of the long-term exhibition. We believe that accessibility is conceptually important for any public building, both when it comes to its interior and exterior; in our case that includes accessibility of public transport stops, situated immediately outside the museum, and used by employees and visitors on their route to and from the museum. The intention of our transformation process was to bring a change to the way a community sees a museum. We have included the community in the process of the museological program creation, and that collaborative process is reflected in the Museum's cultural programming. These participatory projects are result of collaboration and partnership with other entities, local associations and consultants from different areas of knowledge, coming from local, regional and national teaching institutions. We welcome music, theatre and dance presentations from local art schools, where the museum has a role of a classroom, but addressed to the general public. Also, the museum team actively investigates and produces scientific knowledge. It implements activities aimed at promoting social development, community engagement and environmental balance. It promotes education and training about heritage for different social groups of all ages in an inclusive way. Since its opening, the museum has organised more than 300 activities, which have involved more than 60 entities and partners. 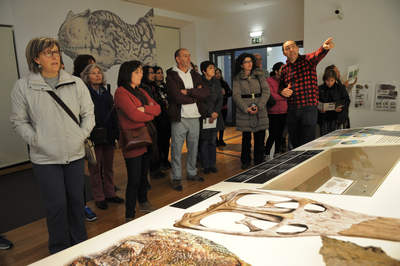 The Leiria Museum offers an articulated program of educational services, encompassing guided visits, diverse pedagogical workshops and routes, meant not only for schools but also for the general public, and including specific activities for those with special needs. The Museum accepts trainees from local, regional and national schools, as well as volunteers. To manage and coordinate the volunteers' activities, an ad hoc volunteering database run by city officials is used. More than 40 volunteers and trainees have been received since the Museum's opening. We believe that the reason we have a successful and sustainable resource of volunteers is the fact we only accept volunteers that have training in the specific areas for activities or projects - they are happy volunteers, but more importantly, passionate volunteers. We make sure a project that suits each volunteer is found, but with specific goals for everyone. The Leiria Museum intends to continue presenting diversified programmes based on partnerships with diverse local and national entities. Since the opening, we have received more than 37,000 visitors, who could find their way through the regionrs"s history and the collections we have been preserving for the future. In 2016, the Leiria Museum received several awards for its excellence: in museography, by the Portuguese Association of Museology (APOM), for physical accessibility, by the association Acesso Cultura (Culture Access), and for being the most accessible municipal museum in Portugal, by the National Institute for Rehabilitation (INR). The Museum was also the Silletto Prize winner at the European Museum of the Year Award 2017. The European Museum Forum awarded us that prize for demonstrating excellence, over the past three years, in involving local community into planning and developing museum and heritage projects, or attracting outstanding support from the work with volunteers, with the goal to enhance public quality of the museum. In the Jury's own words, "This award goes to a museum that is a living community in itself, pro-actively serving the residents of both city and region. A light and welcoming atmosphere, unpretentious approach to the history of the city and the region, through a large range of interactive activities offering intellectual and emotional learning and connecting the experience with today's community. Staff and volunteers work together across all the museum's initiatives. The museum coordinates the programming of the city's other heritage sites, in a sustained and systematic cooperation, a place where working in partnership is viewed as both a challenge and an opportunity for pleasant engagement by all its stakeholders." We could not be more proud of our museum, since we work every single day to achieve that goal ndash; being a living museum that is at the same time indivisible from the living region and the vibrant city and community.